Post Office Food Drive Helps Local Churches: LHCF Feeds 2,000 Individual Each Month! I have shared many times about my experiences Growing Up Hungry and Why I Choose to be Frugal. This is exactly why I am so passionate about the Stamp Out Hunger Post Office Food Drive and the local food pantry I want to introduce you to today! Each year the US Post Office asks us to join them in the largest food drive by setting out some food on our porches for them to collect. After setting out our food, we trust that the food will make into the hands of the families that are struggling and need them. I have had the special opportunity to be on the other side of the largest food drive. After the postal worker fills their trucks with our non-perishable donations, they deliver them to a drop off point. For many years I have volunteered my time to help sort and store the food that the postal workers collect and drop off at Lord of the Harvest Christian Fellowship. Year after year the amount of food collected has far exceeded my expectations. In a time when I would have assumed people would be holding back due to their own circumstances, they have not! In fact I would say that people are very generous during the food drive. At the end of the food drive day, the pantry is always overflowing! This is such an awesome sight to see. In Michigan the amount of families struggling right now is astounding. Hunger is touching the lives of people in all of neighborhoods. Hunger knows no prejudice, it touches all kinds of people. And yet we are still a giving people! I want to take a minute to personally thank all of you who set out anything this year for the mail carriers to pick up on behalf of all the families who will benefit from your generosity! Many years ago my family and I had the privilege to serve at this local community church that has a passion for seeing lives in the neighborhood transformed. They have several different community outreaches that they are involved in. But there is one that has continued to be a blessing to so many and I would like to take the time to spotlight today. I wanted to share a little about their food ministry and how it has impacted SO many lives well beyond simply filling belly’s with food. The food bank was started when the office and kitchen workers began giving away the lunches they had packed for themselves each day to the 19 families that had come to look for help from Lord of the Harvest Christian Fellowship. That was the beginning of the Lord of the Harvest Food Bank. God had plans for this small church of about 20 families who had a giving heart! Today, by nothing more than the grace of God, they are able to reach the multitudes! Then He said to His disciples, ‘The harvest truly is plentiful, but the laborers are few. Therefore, pray the Lord of the harvest to send out laborers into His harvest. What began as 19 families and has grown to 1500 – 2000 individuals being fed every month! That is 1,500-2,000 PEOPLE (men, women, and children) that come looking for food and leaving feeling the love of Christ every month. The opportunity to see lives changed through this ministry is a blessing and one that I have had the honor to witness and even partake in. So how does a small urban church with roughly 150 members manage to feed up to 2,000 individuals every month? The Post Office Food Drive which is happening this Saturday, May 14th is one ways that they have been able to fill their pantry shelves year after year. I can remember it seems like every year the shelves would be close to empty just before the Food Drive. The Lord uses things like the Post Office Food Drive to feed people who would otherwise go without, while building the faith of the workers. The Lord of the Harvest receives a large portion of the food they give away from The Post Office Food Drive. When you set those cans out this Saturday, your postal worker will pick them up and deliver them to a local food bank that helps to feed your neighbors. Here is why I LOVE this outreach! Not only do they feed their own community of 2,000 families, but according to Janine Mclatcher whenever they have found themselves in a position of abundance they have increased their serving and giving to other churches, ministries, schools and outreaches such as Macomb Transformed, the local elementary school, EACH, the Detroit Partnership’s Love Feast and more! They have also offered a kids summer lunch program and senior lunch program as well. They are able to do so much for so many with the support of the Food Drive, Gleaners, Forgotten Harvest and private financial donations. Their pantry is open Monday’s, Tuesday’s, and Friday’s from 9:30-Noon. The Stamp Out Hunger Food Drive is this Saturday! The Stamp Out Hunger food drive is a nationwide effort that provides food to local food banks and pantries that rely heavily on donations. With more than 50 million Americans living at risk of hunger, food banks across the country continue to experience record demand for emergency food assistance. The nation’s 175,000 letter carriers will collect food donations left at the mailboxes of generous Americans in more than 10,000 communities and deliver them to food banks and other hunger relief organizations, such as pantries, soup kitchens and shelters. Helping Stamp Out Hunger is as easy as checking your mailbox. 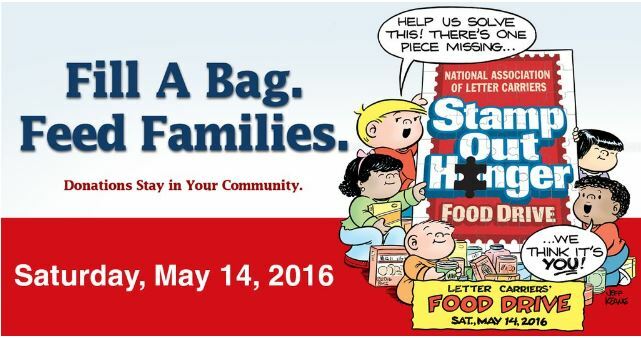 Just leave a bag of non-perishable food items by your mailbox on Saturday, May 14. Your letter carrier will then pick up and deliver the food to a local food bank. Check the expiration dates. While the need for food is great, if you wouldn’t feed it to your family then chances are you shouldn’t pass it on. I have seen stuff come through that had the price labels on them from stores that haven’t existed in my area since I was a girl! Don’t send open/used food. It seems like this should go without saying, but having been on the receiving end of the food drive I’ve seen LOTS of open and partially used stuff come through. Inspect the containers. You should take a few minutes to check your cans for dents or rust and use good judgement. Remember this is about blessing others not just a way to clean out your cupboards. Despite the generosity of millions of Americans who have supported the letter carriers’ food drive in previous years, the need for food assistance still exists for millions of families. According to the U.S. Department of Agriculture’s annual study measuring food security in the United States, more than 50 million Americans, including nearly 17 million children, are food insecure, meaning they live at risk of hunger. Now grab a grocery bag and fill it with blessings for others!! The statistics are shocking and continue to grow everyday, together we can all help. This is an easy way that you can help. Just set out some canned or boxed food on May 14th and your letter carrier will pick it up and deliver it to a food distribution center that will in turn get it to the people who need it most. The need is especially great right now, so instead of naturally gripping tightly to what you have, remember you have it so you can share. We all have something to share. It is also a wonderful way to show your kids that you care about others. I love taking every opportunity to show my kids that we are here to care about people and the Letter Carriers Food Drive is the perfect chance to do this. Did you know that the average age of a homeless person in Michigan is 7 years old! This is for real! Are you planning to participate this year? 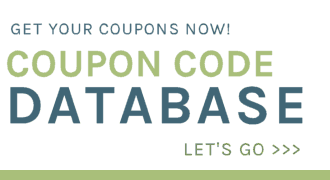 This is such a fantastic program, I almost always forget to leave something out. I need to set myself a reminder. I totally agree that this is an excellent event to support. And I have never thought about being on the other side of the mailbox (so to speak). I think I am going to ask where my community’s cans get sent and help out to. Thanks for the great post and reminder of such a worthy cause! It’s such a great program and one that we participate in every year. I shared this on Facebook, G+1, and Twitter! Thank you for posting this. Such a great cause. We try to put out whenever there is a drive like this in the area.